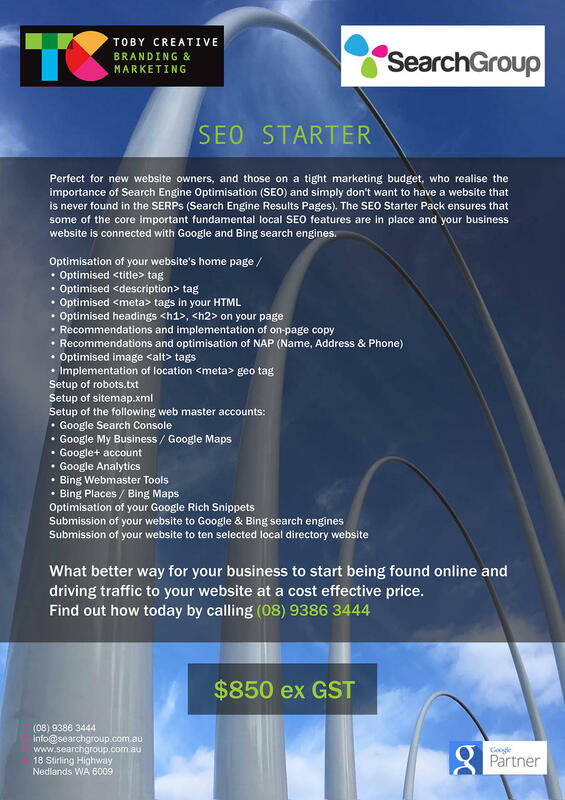 The Search Group SEO (Search Engine Optimisation) Starter plan has been created for budget conscious new website owners who are aware of the benefits in setting up all the fundamental SEO basics; setting up Google Analytics tracking, creating Google Search Console and new Bing Webmaster Tool connections, setting up Google My Business and Google Maps listing of your business, adding important SEO metatags to your website and on-page SEO optimisation, as well as starting the search engine link submissions of your website to key local business directories. Consider this a marketing boost, the kick-start your business needs, particularly if you have just launched a brand-new website and the search engines don’t know anything about your online presence as yet. We do recommend a regular ongoing SEO strategy that continues to build evergreen content, establish regular natural links, and optimises your website based on the interactive feedback from search engines and consumers alike. The SEO Starter plan is a quick, once-off SEO strategy for new websites and local Perth businesses. Download or print-out, our Search Group SEO – Branding & Marketing SEO (Search Engine Optimisation) Starter Plan brochure, then either call us on (08) 9386 3444 to book a no obligation free initial consultation at your location so that we can discuss your specific requirements, or fill in our contact form on this page to send us your details and we’ll contact you back. Ask for our FREE website SEO report to find out the current status of your website and which areas can be improved. Highly experienced local Perth, WA based team working on your project. No lock-in contracts on monthly marketing plans. Cost effective packages as well as custom tailored marketing solutions. Our strategies deliver targeted, qualified leads to your business. We provide measurable ROI results, supported with monthly reporting. Complete integrated marketing solutions to grow your business. Start with a no obligation, free initial consultation at your location. Phone (08) 9386 3444 to arrange your appointment now. Search Group is a; Google Partner, Google Adwords Certified Agency, HootSuite Solutions Provider, MailChimp Expert Company.